Welcome to August's edition of the happy Cat Ezine. I can’t believe that we are already half way through the year already, time has really flown by. Our happy cat continues to grow in popularity and so many of you are now getting involved and submitting your own cat stories etc that it really is turning into the cat community I had always hope for. Remember all you Cat Hut owners to keep on adding pages to your own cats pages, its so easy to do just visit your cats Hut and use the form there to add more stories, pictures, in fact anything you like that tells us more about your cat and your life together. It will be good to see who cat build he best Cat Hut. All areas of the site continue to grow and most of my time is spent adding all your submission and answering a lot of your cat questions. So there is always something new in every area of the site. I have also just started to build a Cat Breeds area which will give some brief details about the many different types of cat breed there are. I thought it was a good idea to add this information as it helps to illustrate not only the many varied breeds there are in the cat world but also how different their personalities and temperaments can be. Which is always good to know when thinking of owning a cat. The Poems and stories area is still rather new but we received a great poem his month called ”Lucy”, it is well worth a read. I found it very touching. Don’t forget if you have a poem or cat story that you think others would enjoy, don’t forget to submit it using the form provided. Here is August's Caption Competition. You are the first to see it as it doesn't get posted onto the site for a few days, so it gives you extra time to get your entries in first. The deadline for this competition is August 24th. 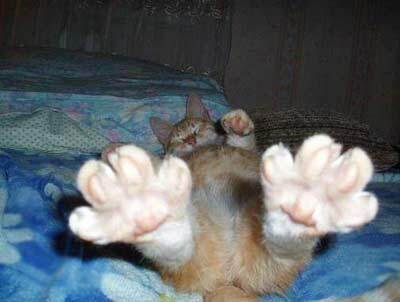 The best caption will be chosen and the winners name and caption will be posted on the www.our-happy-cat.com competition page. 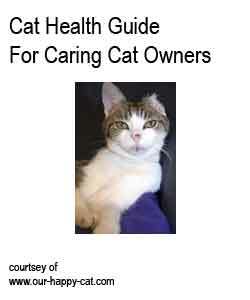 This month the prize is a copy of our Cat Health Guide Ebook and a copy of 100 homemade cat food recipes ebook. Hello every one, I just had to tell you all about my exciting night I had last night. It was a very warm night so I pestered my mum and dad to let me out when they went to bed. I did what I always do when I go out at night, I walked around my territory making sure everything was in order and that no one was trespassing on my turf. Then I went back to the house, I am very lucky because where I live there is a tunnel which separates two houses and the front door is in this tunnel. Normal I go and sit on the front door carpet all night and snooze, but last night things were different. When I got to my tunnel I discovered that there was a fox inside at the far end. Now I'm not scared of foxes and in fact I wanted to go and say hello, but as I walked closer to him he went absolutely berserk. Screaming and jumping up trying to get through a door window. I just sat and watched. Then my dad came rushing out calling my name, I think he thought I was in trouble but I just sat and looked at him. He picked me up and took me into the house then he proceeded to try and get the fox out who by this time was going completely bonkers. What a commotion and at 2am too, I think it really frightened my mum and dad too as they looked really shocked and worried. 4. Article - Kitty, Say Hello To Fido – How to safely introduce a cat and a dog. Unfortunately nature dictates that cats and dogs are not the best of friends in the wild. This can also be true of domesticated animals even though they are so gentle and loving towards their owners. So lots of thought should be carried out before you decide to re-home a dog to a household that already contains a cat. First think about your existing cat, how will they react to a dog invading their territory and will they become unhappy over time. Some cats will eventually accept a dog and they will either become the best of friends or your cat will simply ignore their existence. However some cats may see the dog as a constant threat. This may cause them to react in an aggressive manner or simply to retreat into themselves. It is important that you put your cat’s happiness first before your desire to own a dog. The next thing to think about is the type of dog you want to re-home. Some breeds of dog are natural hunters and so may be more prone to chase and attack cats. It is always a good idea to research the natural characteristics of your chosen breed to see if they are more likely to be accepting of other animals. What ever the breed of dog, it is very important that before you try to introduce your cat to them that they accept you as their master and will have respect for your commands. A dog that will not come when you call or obey the leave command could pose a great danger to your cat. So a basic training period should be carried out first. During this time keep your cat and dog separate, provide special rooms for them and never leave them alone together. This may be difficult at first but it will help your pets learn to trust each other in the long run. After all an unexpected meeting could end in injury or at the very least two very scared animals that will always be afraid of each other. Start the introduction very slowly at first. Take your time and make sure that you are calm and quiet. Animals sense if you are feeling anxious and this will only make them wary too. Always keep the dog on a short lead, so that you have full control over the situation. Get your dog to lie down so that they are in a non-threatening position and provide them with a bone of toy to play with to distract their attention. Then let your cat into the room and allow them to freely walk around. The cat may react in several ways on first seeing the dog. They may sit and hiss, run for cover or be curious and want to come and sniff your dog. While any of this is happening praise your dog when they do not react to the cat and watch your dogs body language for signs of aggression. Be ready to remove your dog from the situation if you feel that tensions are rising. It is a good idea to provide your cat with a bowl of food or treats during these first encounters as this will help the cat associate the presence of the dog with a pleasurable thing. Keep the first few introductions short, perhaps only 5 minutes or so. After awhile the two animals will react less and less to each other and you will be able to keep them together for longer periods. Once you are happy that they are not reacting to each other, you may remove the dog lead, but always remain vigilant. Make sure that you provide both animals with lots of attention during their encounters and try to make the whole process fun and something that your pets will enjoy. If you never reach the stage where your pets are relaxed with each other, it is best to make sure that you always keep them apart or that you make sure that your cat can get out of any difficult situations easily. For instance you could place child safety gates on some of your doors to allow the cat to exit the room but not the dog.